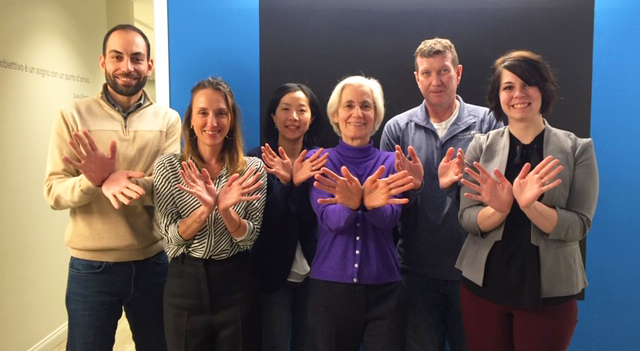 The International Rare Diseases Research Consortium support Rare Disease Day 2019! The recent elected Chair and Vice Chair of IRDiRC, Dr Lucia Monaco and Dr David Pearce, and the accompanying Scientific Secretariat raise their hands for the cause during a meeting at the Italian Telethon Foundation dedicated to set the consortium strategy for achieving its goals for rare diseases. To find out information about the thousands of events happening around the world on this Rare Disease Day, follow the https://www.rarediseaseday.org link. The Toolkit for Patient-Focused Therapy Development was developed in close collaboration between the rare diseases patient advocacy community and the National Center for Advancing Translational Sciences (NCATS) Office of Rare Diseases Research. It is a centralized portal of the “how-to” resources and tools that patient support organizations can use to advance translation for their diseases, from discovery through clinical trials, to regulatory and industry interactions, to post-approval access issues. It guides patients and patient organizations by giving them the means to engage in research, drug development and post-approval issues themselves. While the resources are primarily focused on rare diseases, the tools are useful for all diseases. This US web based resource provides a user-friendly portal gathering information and important tools to ensure that patients are engaged as essential partners from beginning to end of the research and development process. The Genome-Phenome Analysis Platform was developed by the RD-Connect, an EU-funded infrastructure for rare disease data. It is an online tool for diagnosis and gene discovery in rare diseases research. This free-of-charge tool is even accessible for users without bioinformatics background, allowing authorized users to analyze Next-Generation Sequencing (NGS) data and share them with other researchers. An important feature of the Genome-Phenome Analysis Platform is the enabling of the identification of disease-causing mutations in rare disease patients and to link those with phenotypic data of the patients. The platform provides an useful resource to analyse genomic and clinical data. This is particularly valuable for researcher and diagnostic groups that do not have in-house bioinformatics pipelines or able to develop these. Furthermore, data can be processed with multiple file formats allowing for a user-friendly interaction.